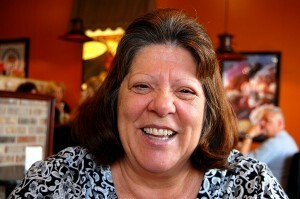 I posted photos of Valentine’s Day cards from Judy and others earlier this year. Judy must have a time capsule like my Mother’s attic, because she brought along our Trinity Lutheran School Kindergarten Graduation picture (with names written on the back) and her 6th Grade School Memories Book. 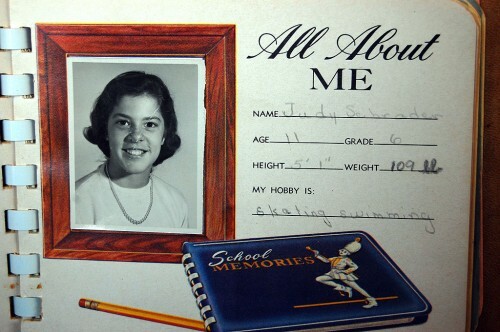 Judy, Age 11, Grade 6, lists her hobbies as skating and swimming. I don’t know about the swimming part, but she and I spent a lot of Friday nights at Hanover Skating Rink. You couldn’t exactly call us an item, but we DID hold hands when we skated. Of course, we didn’t do any of that mushy kind of close skating. I liked her because she liked to skate fast. Hanover wasn’t a fancy rink like MaryAnn’s. The floors were dirty, even on a good night. If it rained, the roof leaked and you had to dodge puddles. If you didn’t have your own shoe skates, you rented heavy metal skates that clipped onto your street shoes. They could unclip just as easily, leaving the skate dangling from your ankle by a leather strap. 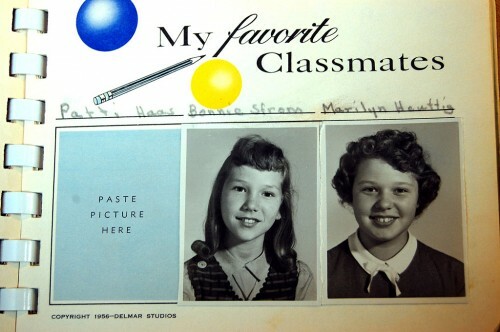 Judy listed her favorite classmates as Patti Haas, Bonnie Strom and Marilyn Heuttig. She has photos of Bonnie and Marilyn, but Patti must have had an inkling even back that far that she would end up in a witness protection program and made sure she didn’t leave any images behind. 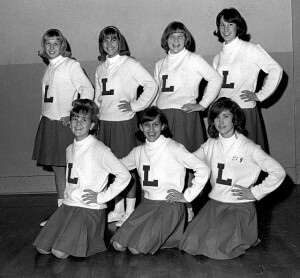 I don’t ever recall seeing this photo of the Trinity Lutheran School cheerleaders. I suspect it showed too much leg for the principal. It’s unseemly to have girls cavorting about. They should be able to just WILL their teams to victory with a subtle hand gesture. This is, you will note, a non-cavorting photo that was suitable to run in the 1961 school yearbook. Each dress contained enough material to construct a six-man tent in case of a Civil Defense emergency. By the time I shot the cheerleaders in 1966, skirts had moved from mid-calf to just about knee level, but the cheerleaders were still firmly planted on the floor. I don’t remember much emphasis on athletics at Trinity. We played ball at recess and I know we had school teams, but I don’t recall ever going to any games against other schools. In the last few years, though, the school has added a state-of-the-art gym to the school. 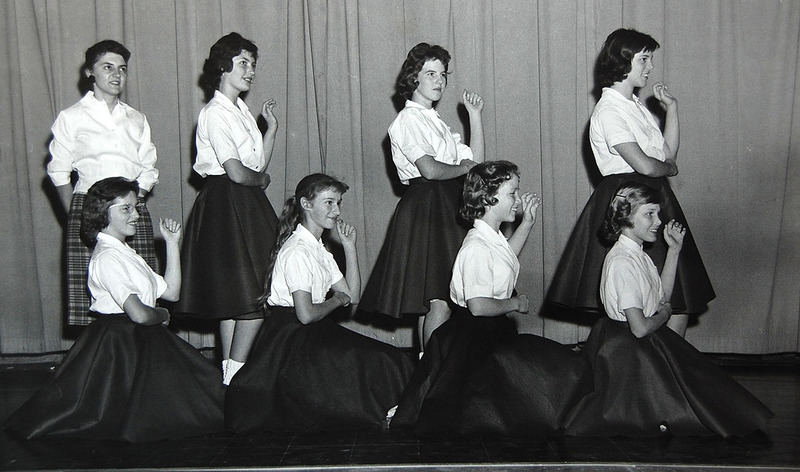 One of these days I’ll run a collection of new and old Trinity Lutheran School pix and you’ll be able to see it. Trinity made a big dead out of Kindergarten and Eighth Grade graduations. Here’s Judy’s photo of our Kindergarten graduation. The well-behaved cherub on the front row, left, is me. If you don’t believe that’s me, check out the IDs written on the back of the print. OK, my name is REALLY Steinhoff, not Stienoff, but that’s close enough. It’s interesting that I could pick out two people before reading the names on the back–Della Heise and Ron Dost. I had a bit of a headstart for Ron. He lived across the street from me from 1954 until his death in 1967. And, of course, Della is no longer with us, either. I was surprised at how many names were in my kindergarten and CHS classes, but not at Trinity for grades 1 through 8. I think I remember someone saying that Trinity was one of the few kindergartens in Cape in those days. I guess they popped in for one year, then hopped over to the public school system after that. My husband Don is the third person, third row. A Roman Catholic boy ended up in a Lutheran kindergarten because the family lived across the alley from the Trinity school. the family later moved and Don attended St. Mary’s with Gerald Love and others. I’m going to run an aerial photo of the school one of these days. I’m sure his house will show up in it. I would love to know the names of the Trinity cheerleaders. Some of them look very familiar. Our oldest was a Trinity cheerleader (when the skirts were above the knee) in 1985 and 1986. She later became a Jackson cheerleader 1986- 1990. It was strange at first wearing black and red instead of black and orange. Ken, you sure get around. You keep current with such a wide group of friends from Cape. I bet you know just as many people from Ohio and Florida. You are the ever curious and ever seeking journalist. I have to admit that it’s taking me longer to work through the Cape era than I thought it would. Every story seems to spin off into a new one. I don’t want to leave you all behind, but I’m itching to get into my Ohio years. That’s where I feel like I did my best work. The cheerleader sponsor in the upper left is Mrs. Janet Muench Meyer. Ken, you went to kindergarten with some really cool kids. I went to the old St. Vincent’s kindergarten which was housed in the nun’s convent on Merriweather. Loved kindergarten, especially the chocolate milk break.